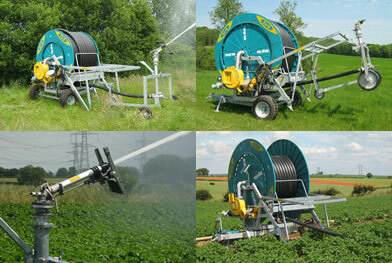 To make the task as efficient and economic as possible we produce a range of over 80 different sized Wright Rain Rainmaker Hose-reel Irrigators which are sold all over the world. The latest models follow in a long line of illustrious machines stretching back to the original “Touraines” produced in the late 1970’s, some of which are still in use today! Wright Rain has the expertise and technical know how as well as experienced personnel to help you choose the correct models with the correct specification to provide you with the required irrigation capacity for your particular situation. The largest “IGD” models are fitted with hoses up to 150mm in diameter and 500 metres long, capable of delivering flow rates over 150m³/h, and hose lengths of up to 700 metres using 110mm diameter hoses. Automatic monitoring of the operating parameters and control of the turbine driven rewind speed with the P450 electronic controller to ensure the correct amount of water is applied and the irrigation cycle finishes precisely on time. Hydraulically operated axles to lower the machine on to the ground when working, hydraulic turntable, staker legs, raingun trolley lifting and front jack. Automatic shut down at the end of the irrigation cycle, or in the event abnormal operating conditions which could otherwise lead to damage to the crop or the machine. PTO driven compressor on the longer/bigger hose models to reduce the weight before moving and pulling the hose out again for the next cycle. 4 wheel tandem axle’s standard on the larger models, optional on the smaller models. Mechanical regulation of the turbine driven rewind system, and shut down at the end of the irrigation cycle or in the event of abnormal operating conditions, with the P450 electronic controller available as an optional extra. Manually operated turntable, hydraulic option on the larger models. Mechanically assisted staker legs and raingun trolley lifting, standard hydraulic operation on the larger models. Mechanically operated front jack, hydraulic option on the larger models. 4 wheel tandem axle and PTO compressor available on the larger models as an optional extra. 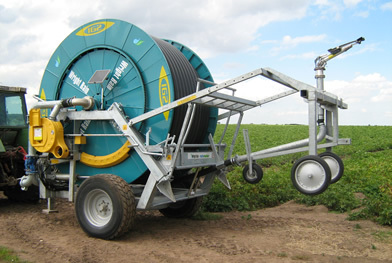 The GSM mobile telecommunication notification and control system can additionally be fitted to machines equipped with the P450 electronic control system, which enables the hose-reel to be monitored and controlled remotely from a mobile phone and will automatically send text messages at the end of the irrigation cycle or in the event of premature shut down due to abnormal operating conditions.